posted by Lisa Ace in Sponsored Post, advertisement, LeRoy Karate, Self Defense, Holidays Gifts, Idea, LeRoy. 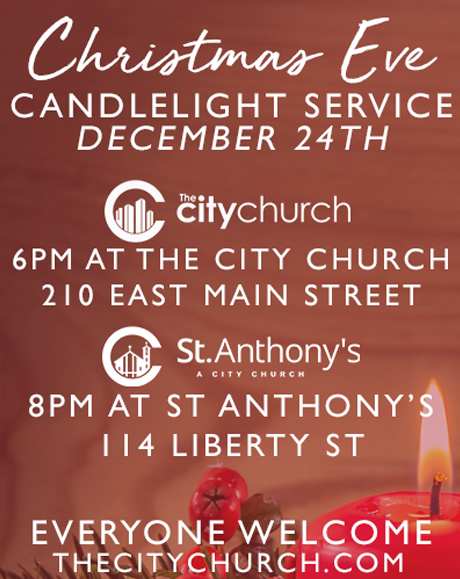 posted by Lisa Ace in Sponsored Post, advertisement, City Church, Candlelight Service, Christmas Eve Service, Mass, batavia. 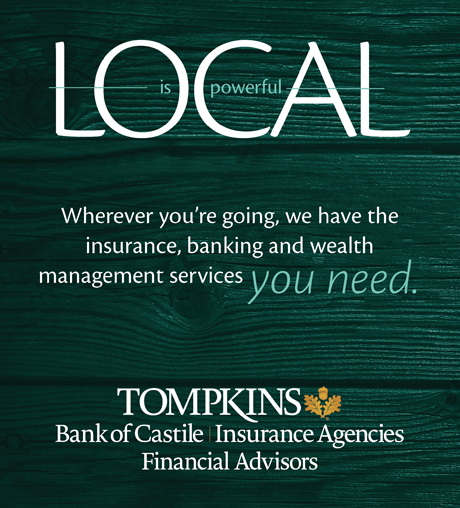 posted by Lisa Ace in Sponsored Post, advertisement, Financial, Tompkins Bank of Castile, INSURANCE, Banking, Wealth Management, local. posted by Lisa Ace in Sponsored Post, advertisement, Reliant Real Estate, Lynn Bezon, happy holidays. 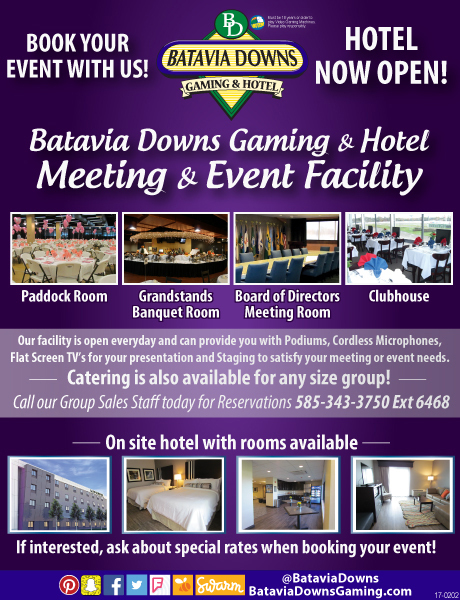 posted by Lisa Ace in Sponsored Post, advertisement, Batavia Downs, gaming, Hotel, Events. Banquets, batavia..
posted by Lisa Ace in Sponsored Post, advertisement, Oliver's Candies, candy, Stocking Stuffers, chocolate, batavia. 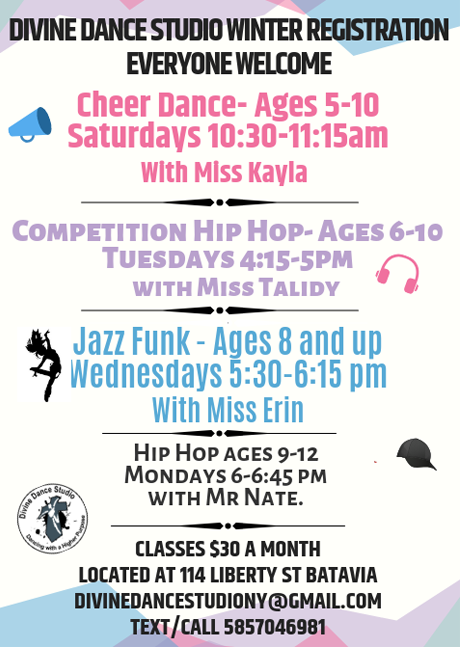 posted by Lisa Ace in Sponsored Post, advertisement, Mancuso Commercial Real Estate, Office Space, Commercial Realty, batavia, Mill Street. To view 1 Mill St., Batavia, please click here for more information and photos. To view 345 W. Main St., please click here for more information and photos. 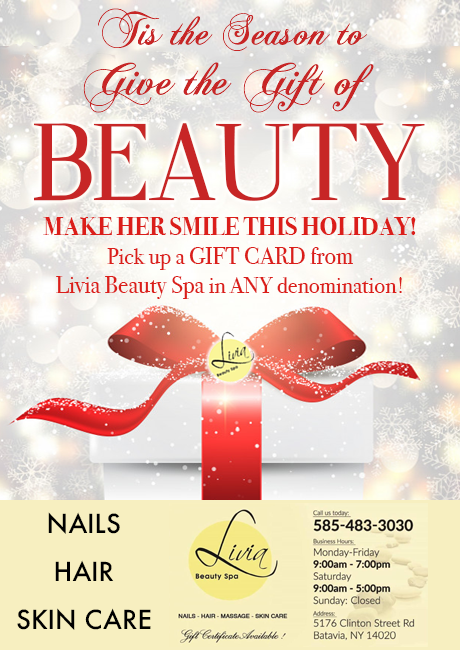 posted by Lisa Ace in Sponsored Post, advertisement, Divine Dance Studio, Registration, Dance Class, batavia..
posted by Lisa Ace in Sponsored Post, advertisement, Livia Beauty Spa, Beauty, hair, Nails, Gift Certificates, batavia.. 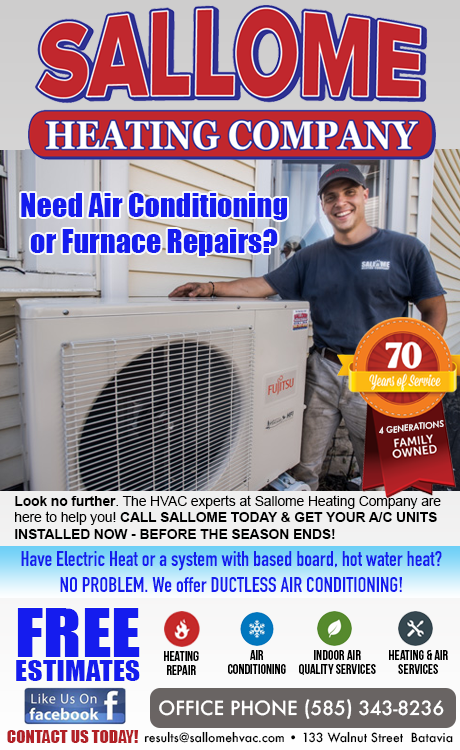 Since your heating system will probably be running constantly throughout the winter, remember to change out your HVAC filters every month. Inspect the insulation in your attic and crawl space. Warm air rises and leaves the house through the roof, so you should focus on insulation in your ceilings. Seal areas around recessed lights, the attic hatch, and plumbing vents that may be allowing warm air from the living space below to enter the attic. Proper attic ventilation, adequate attic insulation, and a tight air barrier between the attic and the interior of the house will work together to prevent ice dams. If you don't have double-paned windows, remove the screens and install storm windows to ensure that the heat stays in and the cold stays out. If you're on a tight budget, pick up an inexpensive plastic-film sheet kit from your local hardware store. These will only last one season, but they do help with energy efficiency and are able to halt the cold flow of winter drafts. If you have a fireplace, burning firewood is another way to save energy costs. When you use the fireplace, reduce heat loss by opening dampers in the bottom of the firebox (if provided) or open the nearest window slightly -- about an inch -- and close doors leading into the room. That will prevent the fire from drawing warm air out of the rest of the house and replacing it with cold air. And remember to store your firewood in a dry place at least 30 feet from your home to avoid a fire hazard. Pipes located in attics, crawl spaces, basements, and near outer walls can be susceptible to freezing in extreme temperatures. When the forecast calls for unusually cold temperatures, let water drip from hot and cold faucets overnight. Also try keeping cabinet doors open to allow warm air to circulate in places like below sinks. If you open the cabinet doors, be sure to remove anything inside the cabinets that may pose a safety to hazard to children, such as household cleaners. For exposed pipes in your attic, basement or crawl spaces, add extra insulation around them. View the tips to avoid frozen pipes for more information. Blackouts and snow-ins can occur during winter months, so take a moment to prepare yourself and your family for such emergencies. Having the following items ready will help you make it through safely. 'Tis the season to be festive, but remember to stay safe with your holiday decorations. Inspect the wires of your light display before switching them on—they may be frayed and present an electrical fire hazard. Same goes for the Christmas tree inside -- always check the light strands for any sign of wear and tear from being in storage. If you have a real Christmas tree, keep it watered, since dry trees catch fire easier. Check with your local municipality for instructions on how to dispose of the tree once the new year arrives. Even with the cold weather conditions, your yard still needs to be maintained. Make sure tree and shrub branches are well away from the house and windows. Icy conditions can cause branches to break and damage your home. Walk around your home and survey the roof to see if any ice dams have formed; call a contractor if you suspect this is the case. As you walk around your house, check the foundation for small cracks or openings where mice or other pests can tunnel in. Winter is when they seek the warmth of your house, so seal up any possible entrances. While you're outside, clear snow off gas meters and away from basement windows and your dryer exhaust vent. posted by Lisa Ace in Sponsored Post, advertisement, Open Houses, real estate, Murray. posted by Lisa Ace in Sponsored Post, advertisement, City Church, Candlelight Service, Christmas Eve Service, Mass, batavia..
posted by Lisa Ace in Sponsored Post, advertisement, Empire Access, Gift of Speed, internet, Phone, cable, Fiber Optic. posted by Lisa Ace in Sponsored Post, advertisement, High Voltage Tattoo & Piercing, Tattoo, Ink, Piercing, holiday fundraiser, batavia. 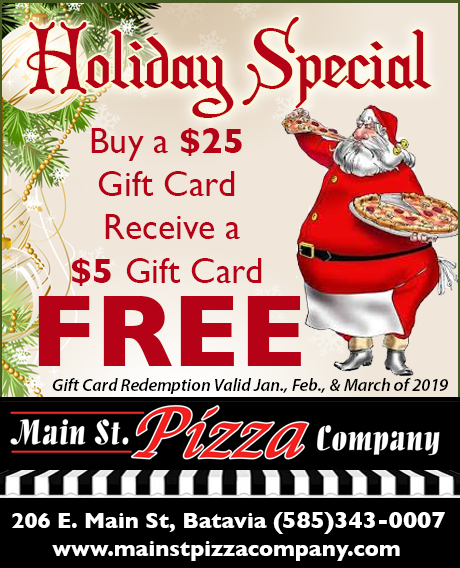 High Voltage Tattoo & Piercing is hosting its annual holiday fundraiser but instead of hosting one big tattoo marathon, owner Mark Fanara is selling gift certificates with all proceeds going to abused and neglected children in Genesee County. Fanara said 100 percent of the price of the gift certificates will go to Justice for Children and Genesee CASA and the gift certificates will be sold at a discount. If you spend $20 for a gift certificate, you will receive a $25 gift certificate, for $50, get $60, for $100, get $125. There is no limit on gift certificates. The sale lasts through Dec. 23. High Voltage Tattoo is located at 110 W. Main St., Batavia. posted by Lisa Ace in Sponsored Post, advertisement, HE Turner, Batavia Funeral Homes, Happy Holidays..
posted by Lisa Ace in Sponsored Post, advertisement, batavia's original, Gift Cards, food, pizza. posted by Lisa Ace in Sponsored Post, advertisement, Batavia Downs, gaming, Hotel, Events. Banquets, batavia. posted by Lisa Ace in Sponsored Post, advertisement, Glass Roots, happy holidays, Gifts Glassware, Glass Blowing, batavia.